Here are three important texts on Holiness taken from: “Council Vatican II, Lumen Gentium”, from the “Catechism of the Catholic Church”, and finally from “John Paul II Apostolic Letter, Novo Millennio Ineunte”. 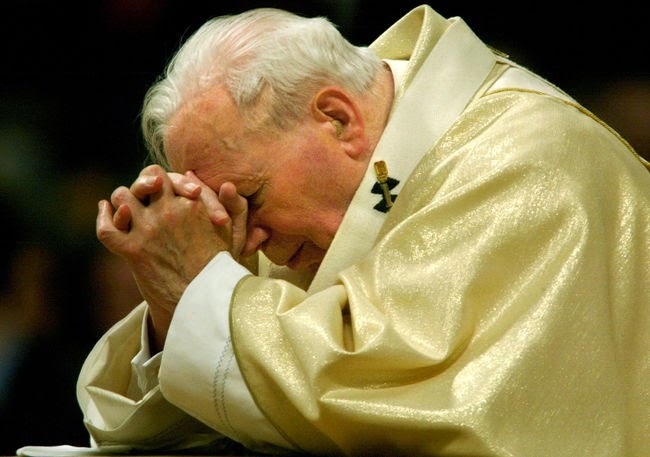 PS If you are in a hurry, please read the last text: “Can Holiness be Planned?” by John Paul II. 39. The Church, whose mystery is being set forth by this Sacred Synod, is believed to be indefectibly holy. Indeed Christ, the Son of God, who with the Father and the Spirit is praised as “uniquely holy,” loved the Church as His bride, delivering Himself up for her. He did this that He might sanctify her. He united her to Himself as His own body and brought it to perfection by the gift of the Holy Spirit for God’s glory. Therefore in the Church, everyone whether belonging to the hierarchy, or being cared for by it, is called to holiness, according to the saying of the Apostle: “For this is the will of God, your sanctification”. However, this holiness of the Church is unceasingly manifested, and must be manifested, in the fruits of grace which the Spirit produces in the faithful; it is expressed in many ways in individuals, who in their walk of life, tend toward the perfection of charity, thus causing the edification of others; in a very special way this (holiness) appears in the practice of the counsels, customarily called “evangelical.” This practice of the counsels, under the impulsion of the Holy Spirit, undertaken by many Christians, either privately or in a Church-approved condition or state of life, gives and must give in the world an outstanding witness and example of this same holiness. 41. The classes and duties of life are many, but holiness is one — that sanctity which is cultivated by all who are moved by the Spirit of God, and who obey the voice of the Father and worship God the Father in spirit and in truth. These people follow the poor Christ, the humble and cross-bearing Christ in order to be worthy of being sharers in His glory. Every person must walk unhesitatingly according to his own personal gifts and duties in the path of living faith, which arouses hope and works through charity. In the first place, the shepherds of Christ’s flock must holily and eagerly, humbly and courageously carry out their ministry, in imitation of the eternal high Priest, the Shepherd and Guardian of our souls. They ought to fulfill this duty in such a way that it will be the principal means also of their own sanctification. Those chosen for the fullness of the priesthood are granted the ability of exercising the perfect duty of pastoral charity by the grace of the sacrament of Orders. This perfect duty of pastoral charity is exercised in every form of episcopal care and service, prayer, sacrifice and preaching. By this same sacramental grace, they are given the courage necessary to lay down their lives for their sheep, and the ability of promoting greater holiness in the Church by their daily example, having become a pattern for their flock. Priests, who resemble bishops to a certain degree in their participation of the sacrament of Orders, form the spiritual crown of the bishops. They participate in the grace of their office and they should grow daily in their love of God and their neighbor by the exercise of their office through Christ, the eternal and unique Mediator. They should preserve the bond of priestly communion, and they should abound in every spiritual good and thus present to all men a living witness to God. All this they should do in emulation of those priests who often, down through the course of the centuries, left an outstanding example of the holiness of humble and hidden service. Their praise lives on in the Church of God. By their very office of praying and offering sacrifice for their own people and the entire people of God, they should rise to greater holiness. Keeping in mind what they are doing and imitating what they are handling, these priests, in their apostolic labors, rather than being ensnared by perils and hardships, should rather rise to greater holiness through these perils and hardships. They should ever nourish and strengthen their action from an abundance of contemplation, doing all this for the comfort of the entire Church of God. All priests, and especially those who are called “diocesan priests,” due to the special title of their ordination, should keep continually before their minds the fact that their faithful loyalty toward and their generous cooperation with their bishop is of the greatest value in their growth in holiness. Ministers of lesser rank are also sharers in the mission and grace of the Supreme Priest. In the first place among these ministers are deacons, who, in as much as they are dispensers of Christ’s mysteries and servants of the Church,(9*) should keep themselves free from every vice and stand before men as personifications of goodness and friends of God. (225) Clerics, who are called by the Lord and are set aside as His portion in order to prepare themselves for the various ministerial offices under the watchful eye of spiritual shepherds, are bound to bring their hearts and minds into accord with this special election (which is theirs). They will accomplish this by their constancy in prayer, by their burning love, and by their unremitting recollection of whatever is true, just and of good repute. They will accomplish all this for the glory and honor of God. Besides these already named, there are also laymen, chosen of God and called by the bishop. These laymen spend themselves completely in apostolic labors, working the Lord’s field with much success.. Furthermore, married couples and Christian parents should follow their own proper path (to holiness) by faithful love. They should sustain one another in grace throughout the entire length of their lives. They should embue their offspring, lovingly welcomed as God’s gift, with Christian doctrine and the evangelical virtues. In this manner, they offer all men the example of unwearying and generous love; in this way they build up the brotherhood of charity; in so doing, they stand as the witnesses and cooperators in the fruitfulness of Holy Mother Church; by such lives, they are a sign and a participation in that very love, with which Christ loved His Bride and for which He delivered Himself up for her. A like example, but one given in a different way, is that offered by widows and single people, who are able to make great contributions toward holiness and apostolic endeavor in the Church. Finally, those who engage in labor—and frequently it is of a heavy nature—should better themselves by their human labors. They should be of aid to their fellow citizens. They should raise all of society, and even creation itself, to a better mode of existence. Indeed, they should imitate by their lively charity, in their joyous hope and by their voluntary sharing of each others’ burdens, the very Christ who plied His hands with carpenter’s tools and Who in union with His Father, is continually working for the salvation of all men. In this, then, their daily work they should climb to the heights of holiness and apostolic activity. May all those who are weighed down with poverty, infirmity and sickness, as well as those who must bear various hardships or who suffer persecution for justice sake—may they all know they are united with the suffering Christ in a special way for the salvation of the world. The Lord called them blessed in His Gospel and they are those whom “the God of all graces, who has called us unto His eternal glory in Christ Jesus, will Himself, after we have suffered a little while, perfect, strengthen and establish”. 42. “God is love, and he who abides in love, abides in God and God in Him”. (227) But, God pours out his love into our hearts through the Holy Spirit, Who has been given to us;(228) thus the first and most necessary gift is love, by which we love God above all things and our neighbour because of God. Indeed, in order that love, as good seed may grow and bring forth fruit in the soul, each one of the faithful must willingly hear the Word of God and accept His Will, and must complete what God has begun by their own actions with the help of God’s grace. These actions consist in the use of the sacraments and in a special way the Eucharist, frequent participation in the sacred action of the Liturgy, application of oneself to prayer, self-abnegation, lively fraternal service and the constant exercise of all the virtues. For charity, as the bond of perfection and the fullness of the law, rules over all the means of attaining holiness and gives life to these same means. It is charity which guides us to our final end. It is the love of God and the love of one’s neighbor which points out the true disciple of Christ. Likewise, the holiness of the Church is fostered in a special way by the observance of the counsels proposed in the Gospel by Our Lord to His disciples. An eminent position among these is held by virginity or the celibate state. This is a precious gift of divine grace given by the Father to certain souls, whereby they may devote themselves to God alone the more easily, due to an undivided heart. This perfect continency, out of desire for the kingdom of heaven, has always been held in particular honor in the Church. The reason for this was and is that perfect continency for the love of God is an incentive to charity, and is certainly a particular source of spiritual fecundity in the world. The Church continually keeps before it the warning of the Apostle which moved the faithful to charity, exhorting them to experience personally what Christ Jesus had known within Himself. This was the same Christ Jesus, who “emptied Himself, taking the nature of a slave . . . becoming obedient to death”, and because of us “being rich, he became poor”. Because the disciples must always offer an imitation of and a testimony to the charity and humility of Christ, Mother Church rejoices at finding within her bosom men and women who very closely follow their Saviour who debased Himself to our comprehension. There are some who, in their freedom as sons of God, renounce their own wills and take upon themselves the state of poverty. Still further, some become subject of their own accord to another man, in the matter of perfection for love of God. This is beyond the measure of the commandments, but is done in order to become more fully like the obedient Christ. Therefore, all the faithful of Christ are invited to strive for the holiness and perfection of their own proper state. Indeed they have an obligation to so strive. Let all then have care that they guide aright their own deepest sentiments of soul. Let neither the use of the things of this world nor attachment to riches, which is against the spirit of evangelical poverty, hinder them in their quest for perfect love. Let them heed the admonition of the Apostle to those who use this world; let them not come to terms with this world; for this world, as we see it, is passing away. For further reading of this Document and for the footnotes click here. Can holiness ever be “planned”? The following text is from John Paul II (bold underlining is from me). It is a revolutionary text ! “30. First of all, I have no hesitation in saying that all pastoral initiatives must be set in relation to holiness. Was this not the ultimate meaning of the Jubilee indulgence, as a special grace offered by Christ so that the life of every baptized person could be purified and deeply renewed? It is necessary therefore to rediscover the full practical significance of Chapter 5 of the Dogmatic Constitution on the Church Lumen Gentium, dedicated to the “universal call to holiness”. The Council Fathers laid such stress on this point, not just to embellish ecclesiology with a kind of spiritual veneer, but to make the call to holiness an intrinsic and essential aspect of their teaching on the Church. The rediscovery of the Church as “mystery”, or as a people “gathered together by the unity of the Father, the Son and the Holy Spirit”,15 was bound to bring with it a rediscovery of the Church’s “holiness”, understood in the basic sense of belonging to him who is in essence the Holy One, the “thrice Holy” (cf. Is 6:3). To profess the Church as holy means to point to her as the Bride of Christ, for whom he gave himself precisely in order to make her holy (cf. Eph 5:25-26). This as it were objective gift of holiness is offered to all the baptized. 31. At first glance, it might seem almost impractical to recall this elementary truth as the foundation of the pastoral planning in which we are involved at the start of the new millennium. What might the word “holiness” mean in the context of a pastoral plan? In fact, to place pastoral planning under the heading of holiness is a choice filled with consequences. It implies the conviction that, since Baptism is a true entry into the holiness of God through incorporation into Christ and the indwelling of his Spirit, it would be a contradiction to settle for a life of mediocrity, marked by a minimalist ethic and a shallow religiosity. To ask catechumens: “Do you wish to receive Baptism?” means at the same time to ask them: “Do you wish to become holy?” It means to set before them the radical nature of the Sermon on the Mount: “Be perfect as your heavenly Father is perfect” (Mt 5:48). As the Council itself explained, this ideal of perfection must not be misunderstood as if it involved some kind of extraordinary existence, possible only for a few “uncommon heroes” of holiness. The ways of holiness are many, according to the vocation of each individual. I thank the Lord that in these years he has enabled me to beatify and canonize a large number of Christians, and among them many lay people who attained holiness in the most ordinary circumstances of life.